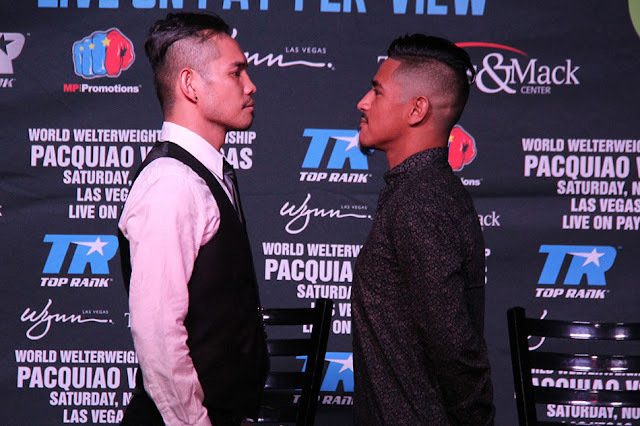 Donaire vs Magdaleno finally met in their Press Conference in Las Vegas Nevada Tuesday, September 27, 2016. Donaire and Madaleno is set to fight for the WBO World super bantamweight title in the undercard of Pacquiao-Vargas title fight. "Jessie is a great challenger, a mandatory title defense and I know he's hungry because he has been calling me out on social media,". "I am working great with my new trainer Ismael Salas. We are learning about each other and he's instructing me on a more precise, compact way of fighting while still being very explosive as everyone is going to see on November 5." Donaire also said that he will do what always he does in the ring. And on November 5, 2016 he can defend his title and against the younger boxer like Magdaleno. Nonito said also in the interview that he is the king right now in the super bantamweight division and he defeated some of the undefeated boxers like Magdaleno. "As a kid I've dreamt of this moment and the time is finally here. On November 5th I will be victorious with my hands raised up high and a belt around my waist,"
In the interview Magdaleno added that his youth power and speed will be the great advantage to defeat Donaire, He also said that he is born to be a champion and he will prove it on November 5, and on that day people will know who Magdaleno really is. He also called Donaire weaken's in the later round and loses heart in the fight! Donaire vs Magdaleno is slated on November 5, 2016, as the co-main event of Manny Pacquiao vs Jessie Vargas fight for the WBO world welterweight championship.